What’s Your Price Tag? • Run Hard. Rest Well. Note: This post is part of our original series on rest. We are reposting some of our favorite articles because we believe they’re just as important today as ever. We hope you’re challenged to think of rest in a fresh new way. There is a price to be paid for our chronic exhaustion. For some people it’s apparent in the here and now: fleeting joy, fragmented relationships. Sometimes it comes and goes: bouts of sleepless nights, depression, illness. Some people seemingly sail through their overload, but in the end 5, 15 or 30 years are extracted from their lives. What’s the cost of your overload? Is it worth the price tag? Three important questions come to mind when I take a look at the future state of my rest and unrest. Am I willing to pay the price? What do I need? A lot. The dentist tells me I need to floss. My doctor tells me I need to lose 15 pounds. The government tells me I need to pay my taxes. My kids tell me I need to dye the gray out of my hair. Since our basic needs for clean water, food, safety and shelter are typically met, most of my needs are really a matter of wants. My wants are driven by 1) my pursuit of a reward or 2) my desire to avoid negative consequences. Seeking the reward or suffering the consequence of flossing (or not flossing), dieting/exercising or dyeing my hair have not yet risen to the top of my to do list. Paying taxes is not a want, but I seek to avoid the painful consequences, so I am willing to pay the price of seeing that it gets done. The real question behind needs and wants in modern society is: Am I willing to pay the price? There is a price to be paid for our exhaustion. There is a price to be paid for our restoration. Rest does not come free. It requires a radical revision of thinking and beliefs. It demands an alteration of how life unfolds. The cost is high. It’s painful to face the reality of our own limits. It’s brutal to disappoint others and perhaps, even more brutal to disappoint ourselves. But the consequences of not attending to our basic needs for rest are staggering. The rewards are out of this world. The first step I’d like you to consider is a very short inventory and assessment. James A. Garfield once said, “The truth will set you free, but first it might make you miserable.” This inventory is short. Very short. I hate tests. I hate the time they take. I also recognize test anxiety. When I take a test I know what an inventory is looking for so authentic results can be easily skewed. I’ve kept this in mind in case you’re like me. The real key to this four-question assessment is to hand it off to someone who knows you well. It may give you a more accurate (however painful) assessment. I double dutch dare you. It might even launch a very intriguing conversation. Place a check mark in front of every question that is 100% true. This is a snapshot of your life today, not all time and eternity. It gives you information about this moment in time. ____ In the last 4 weeks I’ve enjoyed 4 days off—days that were refreshing and care-free…with minimal “work” around the house. ____ This last week I’ve had five nights of 7-8 hours of sleep. ____ I took a full-day of personal retreat in the last 6 months. ____ I enjoyed 4 evenings this last week with no out-of-the-home obligations. ____ I took all my vacation time last year. Score: 0-3 You are running on the fumes of an empty tank whether you realize it or not. There’s a better way. It’s found in the rhythm—run hard. rest well. A paradigm shift must take place in your heart. Rest is not a sign of weakness. It is a gift, a grace, a rhythm of life for those who surrender all—including the time it takes to rest. The vibrancy of your ministry, the well-being of your soul and the health of your family depend on it. Score: 4 You are familiar with rejuvenating aspects of rest and renewal (well done good and faithful servant! ), but gaps remain. You know how to run hard and you are aware of what it means to rest well. Now take a look at your physical, emotional, spiritual, relational reserves. What are your strengths? Where can you improve? Expand your horizons. What needs attention? Explore how “resting well” will bring new realms of vibrancy to an area where you’re serving with a self-imposed limp. Score: 5-6 Ah! The life-giving rhythms of rest are established in your life. You have adopted God’s ways and not the worlds. The fruit of well-being is yours to enjoy—and pass along to others. Stay the course. Your life is a walking billboard. Be intentional about sharing the story of your journey into the rhythms of rest. You have a remarkable opportunity to light the way. Rest. Do you need it? Do you want it? Are you willing to pay the price it demands? This week, set aside a block of one to three hours to – not work. Plan for it. Anticipate it. Guard it. The only requirement of this time is to do something that brings delight. Splurge on a special cup of coffee. Have lunch with a friend. Make a date with your pillow. Get outside. Turn off your phone. Release yourself from all demands. Step into this time completely, utterly guilt-free. Why? The first thing God called holy was not himself, the act of worship or the splendor of creation. The first thing God called holy was time set apart to rest (Genesis 2:3). 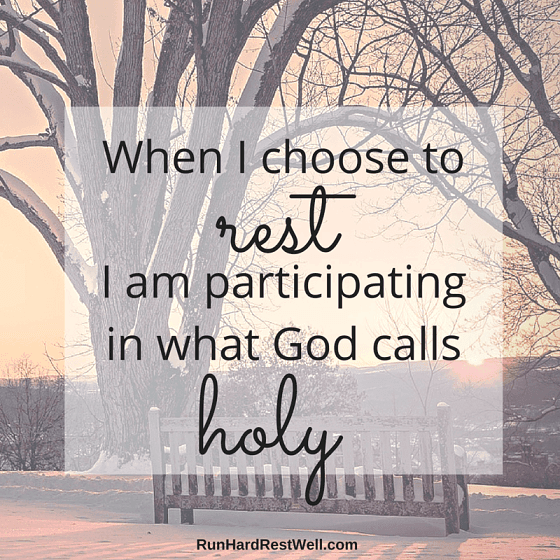 When I choose to rest, I am participating in what God calls holy. Do you need it? Do you want it? Are you willing to engage in that which is holy? I think I’m hopeless. I will go to eat and a show with a friend on Saturday for my birthday. Celebrate, right? But I know me and I will be ministering to this lady. We will fellowship in Christ, but I will work hard to offer her all I am in JESUS. Somehow I find that to not be rest. Betty, I believe you are hope. It comes through you from the Holy Spirit. You believe, you know, you have faith. You worry about the welfare of others. Happy Birthday! I pray it is such a blessed day for you. Thank you, Erin. I was thinking about and praying for you today. You have popped often into my mind. You have such a powerful joy inside of you, it can’t help but come out. You do need to rest. You need to listen to what is true and throw away the garbage heaped on you. You have great power in the Holy Spirit. Don’t allow guilt to keep you from resting and rejoicing in our Daddy God! Rest well, sweet friend! I am really enjoying the ministry articles you send along. Keep up the great work. Haven’t heard much for a while regarding family, but praying for you regularly. Blessings, Steve Cunnington. Steve, Thank you! As a family, we journey on. I’m doing a lot of reflecting right now, assessment. What is the condition of my reserve tanks? Taking time to tank up. The horizon spans before us. Okay when I read the title of this in my email I thought “There is no price, I am bought and paid for by God.” Then I delved into the topic. I had a lot of “yes” and “no” answers that went together. They seem to live side by side. Yes I am happy, happy with my children, with my co-workers, with my family. No I am not happy with situations, most within my control; addictions. And the things I try to control, but shouldn’t. Some days I feel like Paul. Work around the work schedule, then around the children, around church meetings, around those things that show up. It is about time I just scheduled rest. 3 hours a week does not seem like much, but I know those three hours will bring need moments of rest. Thank you for this post. Erin! 3 heave-sent hours. Have they unfolded yet? I pray they did. It is amazing what God does with 3 hours. We’ve got a snow day here in Indiana! All the kids are home — with all the joys and challenges this brings! I did not realize it, but yes the hours came. A few hours with a friend. Some time to paint, Time with God is so amazing. Blessed snow days :). We had 10 during SNowvember. 8′ plopped overnight. We couldn’t see our cars in the driveway. No work, no school. Joyous hard work, time with the neighbors. Amazing what God blows our way. PS, Brenda I am praying that you and yours have a blessed snow day.